When a dental emergency strikes, Emergency Dentists USA has the right Fontana emergency dentist for your dental problem. From after hours dental clinics with hours that extend into the evening until 7 p.m., to dental clinics with openings on Saturdays, Fontana emergency dentists on Emergency Dentists USA are standing by to treat your dental emergency right now. Check out our 24-hour dental emergency hotline to obtain help from a live operator who is standing by to help you to choose an excellent dentist or even make that first dental appointment. I’m happy I found this website before I had a severe toothache that hit me Labor Day weekend! There was a lot of helpful information for home remedies and several dental clinics that had hours that worked for me. 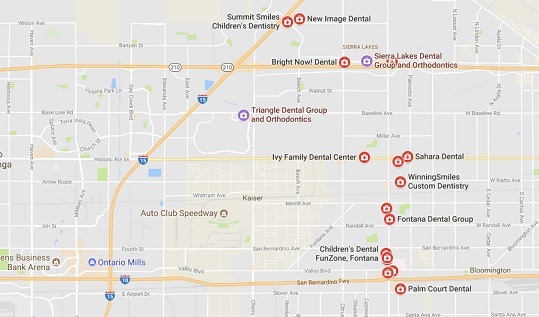 Our comprehensive listing of Fontana emergency dentists offers you a great dentist located near your home or offering hours that suit your needs. Clinics that specialize in being open 24 hours a day are not available in Fontana. There are great 24-hour hospital emergency rooms that are always open to cater to your dental emergency. Regular dental offices that offer after-hours dental care are common in Fontana, making it simple to get great dental care on your schedule. Pick Sierra Dental Group if you need a dental appointment on a Saturday or Bright Now! Dental if you are needing an appointment after hours. Emergency Dentists USA makes it easy to choose an amazing Fontana emergency dentist regardless of your dental emergency. When you are in dental pain, you definitely do not want to be wandering a strange city searching for a great dentist. Emergency Dentists USA has a convenient listing of after-hours dental clinics located below. Simply scroll through our listings and choose a dentist right now. Description: When you encounter serious dental problems, there is nothing like knowing that a warm and gentle professional will see you soon! At the first sign of an aching tooth, you can use our hotline to see just how well we can fix you up, and marvel at how quickly we can locate an after hours pro for you. Description: Bright Now! Dental provides a friendly and caring environment for your dental needs. Whether you are suffering from a cracked tooth or a painful toothache, Bright Now! Dental offers dental services at competitive prices with office hours to suit your needs. Description: Triangle Dental Group is an ideal emergency dentist for those who live in Fontana, California. With four dentists, five specialists, and an office manager you can rest easy knowing that your problems will get taken care of by a very professional staff. You may want to consider visiting the emergency section of their website as they will walk you through what to do if you are experiencing an emergency. 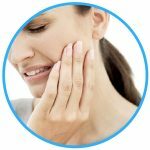 Description: Whether you are suffering from a painful abscess or simply a lost filling, Sierra Dental Group is standing by to relieve your pain and get you back on the road to recovery. Saturday office hours and evening hours on Wednesdays make it simple to see a wonderful dentist without the hassle of waiting days or weeks for an appointment. Description: With office hours running through the evening and dentistry appointments available some Saturdays, one should give this office a good look. Doctor Howard Glassman is the lead dentist and started the Dental Group back in 1988 and has been successfully delivering dentistry services to Fontana residents. With the level of expertise at this location, you are able to get the fullest, most comprehensive dental care. – Have your paperwork, health records, and insurance information ready. These items can help your new dentist to determine the best treatment for your dental emergency. – Arrive early to facilitate filling out paperwork, which ensures that you have plenty of time to ask questions about your procedure. – Make sure you know how you’re going to pay and if the dentist accepts your form of payment, cash, credit, or insurance. – Make sure you know if your insurance is accepted at this dentist. Choosing a dentist who participates in your dental network saves you money. – Just like any medical visit, make sure you know if you have any allergies to medicines. Bring a list of your current medications with you to visit your new Fontana emergency dentist. 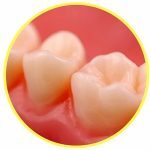 – Do you have intense dental anxiety or fear? The staff can help you to feel more relaxed during your dental procedure. 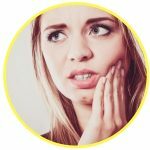 Common dental emergencies include soft tissue injuries to the mouth, tongue, and lips along with broken or knocked out teeth. You may encounter a loose or lost crown, a bracket or wire that is broken on your braces or even an item that is caught between your teeth that makes you uncomfortable. These common dental emergencies are handled quickly by our Fontana emergency dentists. A lost filling is a dental emergency that can become quite painful if the cavity or hole in the tooth is left exposed. Use a piece of sugar-free gum to fill the cavity and to protect the surface of the tooth from food debris. Do not use gum with sugar in it, as this can cause pain when it touches the exposed interior of the tooth. Visit your Fontana emergency dentist as soon as possible to have the filling replaced and to protect your tooth. A loose or lost crown often occurs when you chew sticky foods like gum or taffy. If you are able to find the crown, rinse it with water and fill it with toothpaste or over-the-counter dental cement. Place the crown over the top of the exposed tooth and apply gentle pressure. If the crown is simply loose, try to keep the crown in place until you are able to visit your Fontana emergency dentist. He or she will be able to repair the crown or replace it. An emergency toothache is the most common of all dental emergencies. This often occurs when a tooth is decayed or when there is some type of object caught between the teeth. Use a cold compress outside of your mouth to lessen swelling and pain. Never place an aspirin or another painkiller between the cheek and tooth as this can cause chemical burns to the soft tissue of the mouth. Rinse your mouth with water and floss gently to remove any debris. You might require an emergency tooth extraction if you have a tooth that has decayed beyond the point where a dentist is able to fix the tooth. You might also require this type of dental procedure if your tooth is crowding other teeth in your mouth. It is important not to delay the procedure as this can cause complications including pain. Your dentist begins your procedure by first taking an x-ray of the tooth and performing an examination. He or she chooses a local or general anesthetic to ensure that you do not feel pain throughout the tooth extraction. A special dental tool is used to pry the tooth from the gum, and the gum is stitched closed using a type of suture that dissolves over time. Full healing usually occurs within one to two weeks. Following your emergency tooth extraction, it is important to take any medications as prescribed by your dentist. Avoid eating solid foods or drinking from a straw for at least a few days after the extraction. Options for replacing your extracted tooth might include a dental implant or a dental bridge depending on the location of the extraction. Visit a hospital emergency room if your dental emergency stems from an accident like a fall or sports injury that might include a dangerous concussion or other injuries. Try not to head to the emergency room if you are suffering from a toothache or other common dental emergency. Most hospital emergency rooms are not set up to treat dental problems like a broken tooth or even a simple toothache, and heading to the ER for this type of treatment becomes quite expensive. Visiting a Fontana emergency dentist is the best choice as they are experienced in handling dental emergencies such as an abscess, lost crown or broken braces or wires. 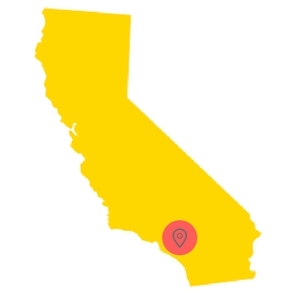 A new dentist should be properly credentialed and licensed for the state of California. Use the American Dental Association’s website to ensure that your new dentist is licensed for your area. The California Dental Association website offers excellent dental information along with great tips for total tooth care.